Print on paper of a deconstructed generic air impact wrench. Power tools are the guns of the none-American world. Read the sad but possibly true story here. 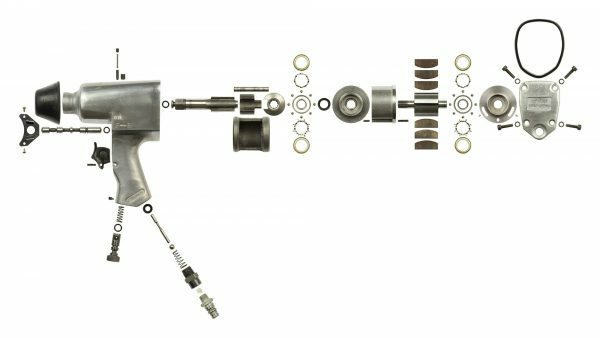 A high quality print on paper of a deconstructed air impact wrench, with stunning detail. All the parts have been photographed separately, before they were all arranged and combined into a single, highly detailed picture. Because of this process, bigger is really better when it comes to Deconstruction prints! In order to truly appreciate the amazing level of detail, they should be viewed as big as possible. The only limits are the size of your wall and wallet, the resolution of the original picture (all prints offered are at least 300 dpi) and the maximum paper size our printer can offer. Even most detail pictures shown here are still not at 100% magnification. So you’re getting even more detail than you thought! All prints are ultraHD photo prints on Fuji Crystal DP II paper, with vivid colours that will last at least 75 years. Printing is handled by White Wall. Read more about this printing process here. We ship prints to most of Europe, the US and Canada and a number of other countries around the world. You can calculate your shipping costs at the bottom of the cart page. For more details on shipping, check here. Please check our FAQ or contact us.